Picture (left to right): Ben Ebihara, GRC Center Director Jim Free. 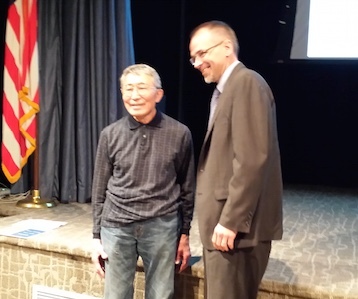 Vantage Partners (VPL) employee Ben Ebihara was the keynote speaker at the Asian-American and Pacific Islander Heritage Month Observance Event held on May 27, 2015 at the NASA Glenn Research Center (GRC). The event was open to all GRC employees. Mr. Ebihara gave a very educational, inspiring, and moving presentation to the attendees which included many of GRC’s top management, among them Center Director Jim Free. Linda Glover, Director of GRC’s Office of Diversity and Equal Opportunity, presented Mr. Ebihara with a plaque in appreciation of his participation and outstanding support. Ben is a NASA retiree and is currently employed by VPL as a Mechanical Engineer where he is providing support to the Superconducting Motor Components and Test Devices Project. Ben was born into a family of Japanese Americans in 1928 in the small town of Clovis, New Mexico. Ben’s journey is one from humble beginnings, through internment, military service, and finally an outstanding career at NASA GRC. Among his major contributions, Ben worked on the Apollo program and has received some of NASA’s most prestigious awards and honors. Ben’s inspiring speech reminded the audience of the issues that divided us during World War II and why they are relevant today. © Copyright 2010 Vantage Partners, LLC All rights reserved.